Lake Houston- White bass and yellow bass spawn is coming to end. Its not over but expect less and less numbers in the creeks and rivers in the coming weeks. Crappie have been playing to working shallow structure has been super effective. Largemouth and spotted bass have been playing more and more. Streamers being the most effective way to find them but dont count out a popper. Weve been getting more and more surface activity! Lake Conroe- finally clearing up and were getting more and more bowfin shots as the water temps warm. Bass are still on beds, along with crappie and throwing gry/wht ep baitfish has been the ticket, with the occasional popper bite. Its coming!! Private water Texas Racks and Quacks Lake- Bass are on beds and should be close to the end. streamers being super effective but again that popper bite is basically here. Huge bluegill have been eating streamers but a little more popper aggressive that the bass so pick your poison. This reports reflect how most local Houston water is fishing so dont count out places like Somerville, Livingston, Lake Raven, Lake Sheldon and so on. Also be on the look out for dams dropping flows and taking advantage of the whitebass, hybass bass and striper bites. Spring is in the air and the bite only gets better!!! Fall fishing is kicking off! Top water Bass, big streamer fishing, White Bass and Crappie coming back into the shallows and more aggressive carp fishing with a little more surface action thrown in the mix. Lake Houston- has been touch and go with rain. But in between periods of clearer water have been productive with some aggressive sunfish action on small poppers and most of the bass picking up crawfish patterns and zonkers in olive. Lake Conroe- Bowfin fishings been decent and getting better with a lot more cruisers shallow. 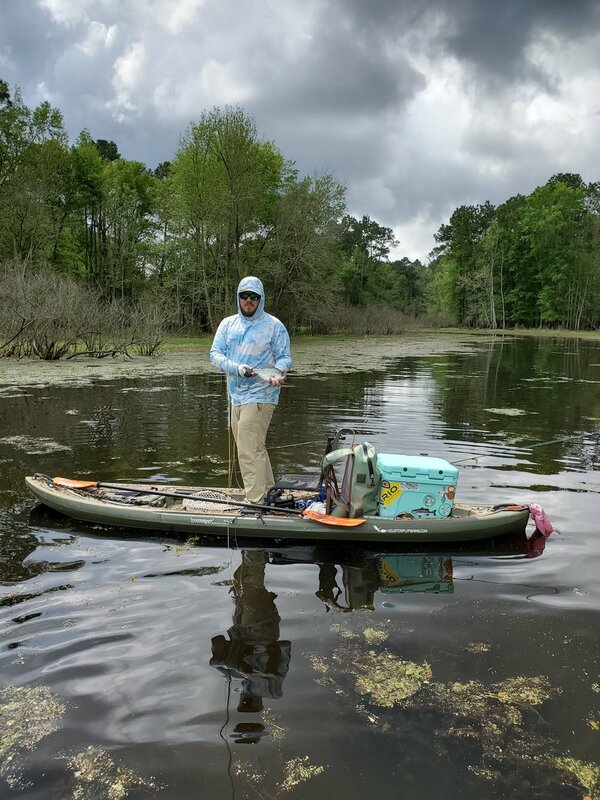 Watch for shad getting blown up Bass have been working them and i had a few Bowfin give themselves away chasing small schools in shallow structure and grass. Topwater fishing for bass has been great early. Bayous- are turning on a little better and getting more comfortable. More aggressive Grassers on the flats and im seeing several more Commons a trip than i had been, so watch for more to show up with this cooler weather. Theres been some great dry fly fishing on dropping flows. Lake Somerville- Topwater bass early and late off shallow structure. White Bass and Hybrids busting shad early off of points and humps. Plenty of happy Commons shallow just gotta find them in clear enough water. Front fishing is here. Some tips for this time of year follow the shad. Fish right up until the front(dont put yourself in danger of course) but the pressure change usually turns the fish on. Then consider sleeping in, go hunt, hike or whatever on those High pressure blue sky days. Also typically the third to forth day after a front can be really good depending on when the pressure changes after the front. This time of year can be touch and go because of weather but also produce big fish on the right days. Lake Houston- White bass, yellow bass and crappie spawn are in full swing and if you wait much longer you may miss it. Largemouth and Spotted bass are staging to spawn though and the topwater bite has started to turn on. Lake Conroe- Bass are on beds and the spawn is kicking off. Bowfin are shallow and water clarity is finally getting sight fishable. Grass carp are of course shallow and gorging most days. Watch for more Lake conroe stuff over the next month as my focus on white bass changes to bass and bowfin. Gar are also getting shallow and the spotted gar have been entertaining. Urban bayous- Carping has been awesome with the carp spawn in full swing, low flows and clear water making for a great time to be carping. Grassers have been surface sipping for at least a month now and im not complaining! Texas Racks and Quacks Lake- Bass are starting to make beds and bluegill have been shallow and super aggressive. Top water bite is just getting off and streamers have been fooling the skeptics. Lake Houston- white bass, yellow bass and crappie are off to a great start. Recent rain and flooding has temporarily blown out the creeks and rivers but look for the fish to turn on as the water drops. Bass are starting to get shallow and their spawn will kick off any day now. Lake Conroe- Bass are shallow are also staging to spawn and the top water bite is almost here with the occasional popper eater right now. 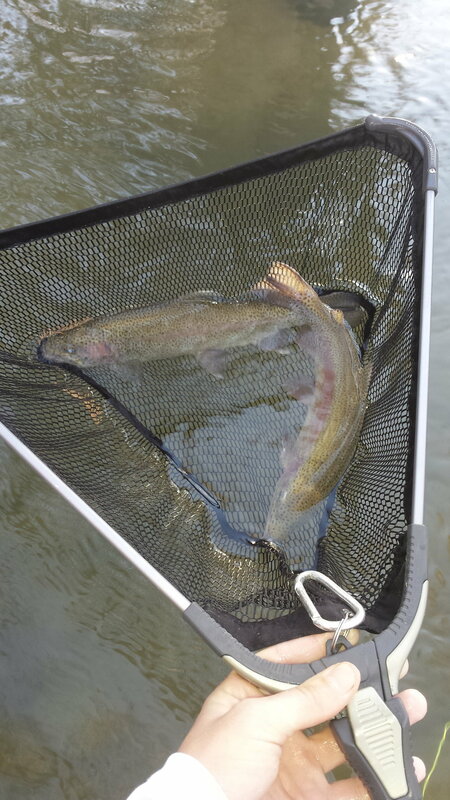 Bowfin are spawning and shallow but water clarity has made sight fishing difficult. Look for clear water or blind cast. Carp and gar are also shallow and frisky. Its a great time of year to to more catching than fishing. Urban Fly Fishing- Dry fly fishing for grass carp has been awesome with the occasional plop eat. Common carp and a few Koi have also been out and very willing to eat. The Commons should be on for the next two months and out in bigger numbers than usual. Smallmouth Buffalo have also showed back up and its a great time to target them. San juan worms being most effictive. Tilapia have also shown back up and are getting into spawning mode also. Texas Racks and Quacks lake- Streamer fishing for bass has been super effective along with the occasional topwater eat. Theyre starting to make beds but not there yet. Any day now though. Bluegil have been on and taking small streamers and nymphs along with small poppers. Lake Houston- a combination of water temps between 45 and 55 degrees(warmer being better) in the creeks and rivers and slightly spiked flows has kicked off the White Bass run, along with Crappie and Yellow Bass. So between now and April are great times to get out and wade the creeks and do a little catching! Urban bayous- haven't been awesome but on select days Grass carp and Commons have been on the flats and catchable. No other reports as of right because that's all I've personally fished lately other than saltwater and a Guadalupe river trip. Good luck out there! Lake Conroe- Bass have been shallow taking poppers and baitfish patterns. Bowfin are in similar areas but don't be surprised if you see one backing or close to it either. Crawfish patterns and small poppers have been working for Bowfin. Grass carp have been a little more frisky and willing to take a well placed fly. Lake Houston- Bass are still taking poppers but the streamer bite has been more consistent. Watch for bass busting shad to especially in lagoons and coves. Whitebass and crappie have started showing up to not in crazy spring numbers but enough to have fun. Urban bayous- Grass carp have been decent and taking plopped flies. Commons mostly scattered but willing to eat if you find em. Tilapia have been taking most small buggy flies similar to your carp bugs. Just keep their attention! Racks and quacks ranch- top water bite has been solid along with a slightly better streamer bite. Pick your poison here fish are feeding. Lake Houston- Sunfish are bedding, Bass bite has been best early in the morning or late in the evening. Poppers are producing with a decent streamer bite in between. Watch for carp they have been around and willing. Urban bayous- Grass carp have been super aggresive along with the Smallmouth Buffalo. Commons are around but mostly scattered lately. Tilapia and Gar have been all over to. Texas, Racks and Quacks- Bass on topwaters or streamers early in the morning and late in the evening. Strip heavier streamers around during the day. Giant Bluegill on poppers or streamers all day. Alligator gar have been cruising and taking decievers. Lake Houston- White bass and Yellow bass are still in the creeks and taking clousers. Largemouth bass are bedding and the topwater bite has turned on. Crappie are being caught shallow off structure. Urban carping- Has been just awesome. Grass carp are eating dries and taking nymphs on the plop. Common carp have been all over the concrete flats and some big schools have been found lately. Alligator gar have started showing up and the Tilapia are all over so keep an eye out. Lake Conroe- Has been showing what it can produce lately. Bass are shallow and bedding. topwater bite has been great in the morning and evenings with a decent streamer bite in-between. Bowfin have been back and forth but up shallow and eating. Its just hard to work through the dang bass. Grass carp have been shallow eating and taking flies on the plop. Texas Racks and Quacks Lake- Bass are bedding and taking poppers early in the morning and late in the evening. Mid day streamer bite has been decent and producing some big girls. Bluegill are eating poppers, clousers and almost anything buggy. White bass, Crappie and Yellow bass are all starting their spring spawning rituals up the creeks and rivers of Lake Houston and across Texas. Just before the rain we were catching some solid male Whitebass along with the occasional female. Once the creeks and rivers start to clear in the next week expect for even more Whitebass and yellow bass to be further up river. We also are catching double digits of crappie most days. A lot of 9 inchers but some decent 12” to 15” fish also. Spotted bass and channel catfish have been making appearances also. Grass carp have been surface sipping consistently. Making it a great time for urban dry fly action! Common Carp have also been roaming the flats and seem very willing to eat almost any well placed bean chain nymph. Tilapia have also started showing up on the flats gearing up for their spawn. Buffalo have been scattered occasionally finding one that'll eat. Reports of buck bass bedding and Bowfin being caught. It's almost time for Bowfin trips! Grass carp are shallow in warmer days and grumpy but will eat. Getting back to my home waters! Whitebass and carp trips officially start February 10th. If you've never fished the run you're missing out! They are fiesty and very willing to eat! Making for a great time to get the kids out, a newbie or yourself! I know most people aren't even trying for carp right now but hey we live in Texas! This time of year we get a lot of rising Grass carp making for a crazy urban experience! Who throws elk hair caddis in a concrete bayou in the winter? This guy!! Couple of things to look forward to this spring. The Bass spawn on Lake Houston and possibly Lake Raven. I'm really looking forward to this one. The Bowfin spawn on Lake Conroe. If you haven't seen Bowfin's spawning colors you are missing out! Google it! Oh did I mention how hard they fight and that they are sight fishable? Since it hasn't been very cold this month so far we're already seeing Whitebass caught up the creeks and rivers of Lake Houston along with Yellow Bass, Crappie, Catfish and Bass. All eating small minnows patterns. Also the Grass carp have been surface sipping consistently. Making it a great time to try and land a 10lb carp on things like elk hair caddis! Smallmouth Buffalo are still around and eating but not to many Commons on the flats. As you know the 5 year drought effected most of Texas. Including our fishing and had caused the Whitebass population to dwindle and for several years on Lake Houston. With almost no flows to spike a spawn and warmer water temperatures we went a couple of years without any spawn at all. On your best days you were lucky to catch 5 Whitebass. Now they were big fish all over 14 inches for the most part, but nothing compared to my beginner days of fly fishing the run and catching so many fish you lose count. It had in fact got so slow the bait chunkers would pull up ask a person how they were doing and just leave. Usually there were 20 cars lined down the road now you'd maybe see 3 of the die hards. Finally during the beginning stages of the 2014 run I caught my first juvenile’s in the 6 inch range and not just one, but fifty in one pocket. I was ecstatic! It had been so long it felt like it would never happen and soon the Whitebass would be non existent. As that season went on we had perfect flows and floods. That made for some decent fishing days nothing crazy but sometimes 10 or more fish if you worked for it. The spawn was happening though and next year was looking brighter. During the 2015 run it was about the same daily numbers did go up slightly. But finally with more 10 to 11 inch fish and the big girls who had been making it through the drought and thousands of jigs, flies and live bait tossed near them. Still improvement and signs of a bounce back were on the horizon and I could almost hear the sound of the drag screaming on my 2wt. This year's run (2016) was the best I can remember. Not necessarily in terms of numbers (though there were some 30+ fish days), but consistently big Whitebass were caught. Average size this year during the actual spawn were between 12 and 14 inches with several 16+ inch fish being caught. (I saw the lake record broke at least 3 times on the fly and not submitted.) Not much under 12 inches through the actual spawn but juveniles were caught but only in the early staging and some as the run tapered off. It's great seeing the lake bounce back so fast and give you so much to look forward to the next year. Of course there's bass and carp fishing still but there is just something about the spring run that just screams fly fishing to me. Plus who doesn't like to break out the 2wt or glass 4wt and wade down a creek throwing clousers with an almost guarantee of getting bent. With all this rain keeping our lakes at pool you can bet next year's run is going to be even better! Well as everyone's noticed, the temperature has dropped and we've been getting a bit of rain. This doesn't mean all hope is lost though! Fish are still biting, you may just have to change your tactics and check flows and water temperature. If you've been waiting to break out your sink-tip line, now's not a bad time. Hint hint, get those flies down! This time of year, I tend to gravitate towards the feeder creeks and rivers looking for White Bass or walking the bayou's looking for rising Grass carp. Don't get me wrong though: Bass are still biting, and if you can get a couple days of consistent weather, you may be able to pull out some big girls. Plus that prefrontal bite can surprise you! Rainbow and Brown trout stockings are starting on the Guadalupe River and can be a great way to get through those cooler, crappy weather days. Dust off your 4wts and nymph boxes and make a weekend out of it! I plan to spend a month or so in the hill country this trout season so look for paddle, wade, and possibly raft trips to be offered very soon until the end of January. Lodging may also be available so please feel free to ask about that. The Guadalupe river is also known for its Striper, so don't be afraid to sneak that 8wt out and bang some streamers! As soon as I get back from the hill country, the White Bass run should be on and dates are already booking up. I still have some weekends open so you may want to book them sooner rather than later. Available dates will be from February to April and this year paddle trips will be offered along with the usual wade trips. Contact Houstonflyfishing@gmail.com for more information. I look forward to fishing with y'all! Since then I have developed a couple ways to target the fish and my favorite is obviously sight fishing. I recently purchased a Diablo Paddle Sport's Amigo sup/kayak hybrid and it's been a game changer poling the mud flats for Bowfin and carp. 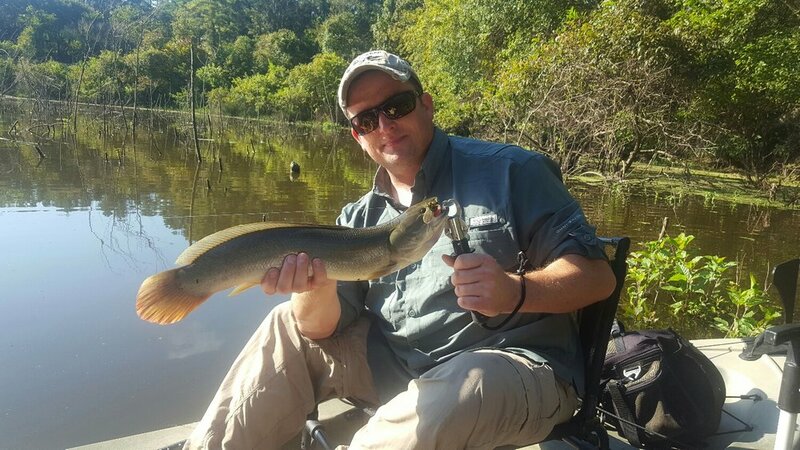 With the ability to stand and pole in a couple inches of water Ive been able to get shots at super skinny Bowfin mudding, tailing and cruising in hunt mode. One big give away I've noticed also while paddling around is to watch for air breathing. They have a lung system similar to a gar and will eventually come up for a breathe in a similar fashion. If you find one gulping air try fan casting that area usually he hasn't gone far and a few casts may come up with a hard thump. If it doesn't try changing flies before giving up on him. They'll hunker down in a hole or under structure waiting for food and defending their spot or territory. The more time I've spent out the more I've noticed certain spots always have the same fish rising. Typically the warmer the day and more active the fish is the more you will find them gulping air and the more shots you'll get. The best by far though is the dap shots next to the yak. When you just happen to lock eyes with a beady eyed Bowfin wriggling his eel like dorsal fin. Yes they will come investigate your boat! Move slow and plop that crawfish pattern right in front of his nose. Twitch it once and do your best to get a strip set. Even if you lose the fish you will never get that creepy image out of your head and will spend the rest of the day hoping for a similar shot. These are just a few of the consistent strategies I've been able to put together. It's still a learning process and hopefully I'll have more to share in the future! For hands on learning book a paddle trip I'll be glad to show you the ropes! Urban Fly Fishing - has been good with nice flows bringing out all the fish. Common carp have been showing up usually as the day warms up. Smallmouth Buffalo are still scattered around. Grass carp have turned on big time and are super aggressive loving the plop. Fall is a good time for urban carping! Lake Houston - The Bass bite has been on along with huge Grass carp! A fantastic popper bite early and late in the evening with some streamer fishing the rest of the time. Olive woolly buggers, various colors of clousers, baitfish patterns, and leggy crawfish patterns. The upper creeks have been awesome with decent clarity and cooler temps making a wade or paddle that much better. Streamer fishing is the way to go if you want to catch multiple species LM Bass, Spotted bass, crappie, channel catfish, Whitebass, various sunfish have been making appearances daily. Grass carp have been found in big groups tailing and backing and even better taking a fly plop in front of them! When I say big I mean 10-20lbers easy! Perfect for sightfishing out of the Diablo’s! Lake Conroe - Bowfin fishing has been on all day. With plenty in the 3-5lb range eating. Mostly pitching streamers to active fish. Grass carp have been more aggressive here also sucking of flies on the plop! I had really been wanting a Bowfin on the fly but didn't really know where to start. I had caught them over the years on accident bass fishing with a plastic worm but never consistently. Well I have been spending a lot of time this year on Lake Conroe fly fishing, paddling, chasing carp and occasionally other species. One day paddling around looking for carp up shallow I look over and notice a Bowfin looking me in the eyes wiggling his eel like dorsal fin almost curiously or excitedly then he darted off under some vegetation. I thought badass and kept going about my day. After several more similar experiences I was starting to form a game plan on how to go about targeting this prehistoric fish. Then one day after getting a little pissed off at some Grass carp. I decided to tie a streamer on and give it a try in an area I had seen a few. I probably casted less than 10 times before I got a hard thump and missed it. A few more cast to the same area and another hard thump but this time I strip set it hard and keep stripping in line not letting up. After a bit of wrangling the fish out of some tree roots and some surprise aerial acrobatics. 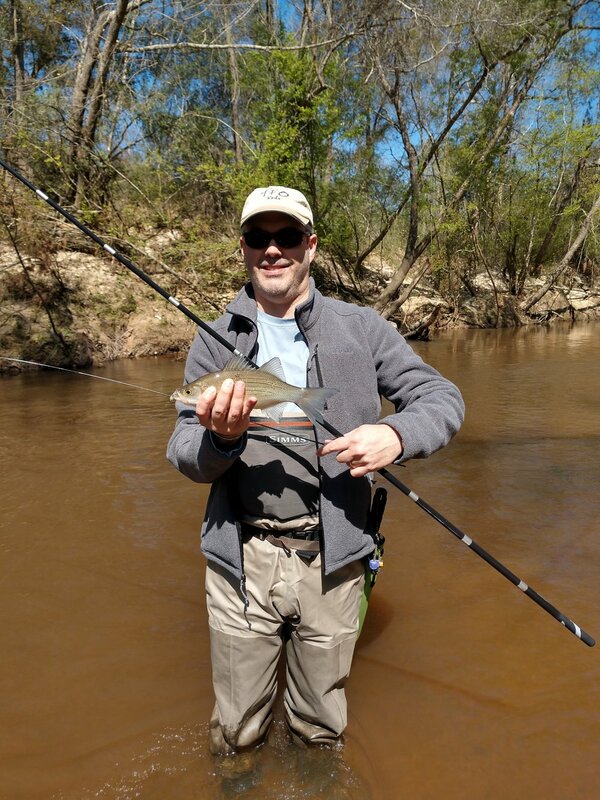 I boated my first Bowfin on the fly! Admired the air breathing prehistoric beady eyed fish with eel like fins and released it back into the murky water. I landed three more in the same area right after that and man do these things fight! I went home stoked ready brag to everyone about my new species on the fly. Urban Fly Fishing - has been good with mostly low flows. Big Common carp have been showing up along with Smallmouth Buffalo and if you happen to be on the water during a minor spike in flows look for aggressive rising Grass carp. Fall is a good time for urban carping! Lake Houston - The Bass bite has been really turning on! A fantastic popper bite early and late in the evening with some streamer fishing the rest of the time. Chartreuse seems to be the ticket for the most part. The upper creeks have been awesome with decent clarity and cooler temps making a wade that much better. Bigger Spotted bass have been tight to structure so expect to lose flies! Lake Conroe - Bowfin fishing has been on mostly during most of the day. Mostly pitching streamers to active fish. Grass carp have been a little more aggressive. Look for the grassers that look for the plop and don't waste time with spooky fish.